The mythical ShareBox. What is it and how does it work? The ShareboB is essentially your central point of interaction with Liberty. The funds that you contribute are deposited into your ShareBox then distributed to those with “claims” by Liberty. Below is what your initial ShareBox will look like and we will continue to share the features we utilize as it happens. · Annual Unshared Amount – As we’ve noted the plan we signed up for has a $1,500 annual unshared amount. Think of this as your deductible in a traditional health insurance plan. This is the section where you will be able to see how much you’ve spent against this amount. The first $1,500 in qualifying medical expenses you spend each year are not shared through Liberty and are paid out of pocket. We will see this section change and the unshared amount increased as we spend on medical expenses without reimbursement. 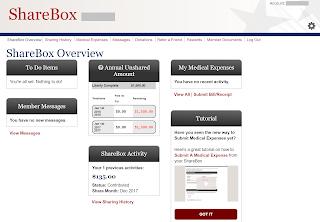 · ShareBox Activity - This is where you see what you have contributed, or “shared”, recently. The $135 that you see above is a recognition that we have paid the initial enrollment fee from Liberty. We will see activity in this section each month as we pay out share amount. · Medical Expenses – This is where, I assume, we will see, and be able to track, expenses that we have submitted for reimbursement. You will also be able to submit your bills for reimbursement directly through the “Submit Bill/Receipt” section. If you have interest in hearing how the process of submitting a bill works directly from Liberty I’ve provided a link to the tutorial video below. 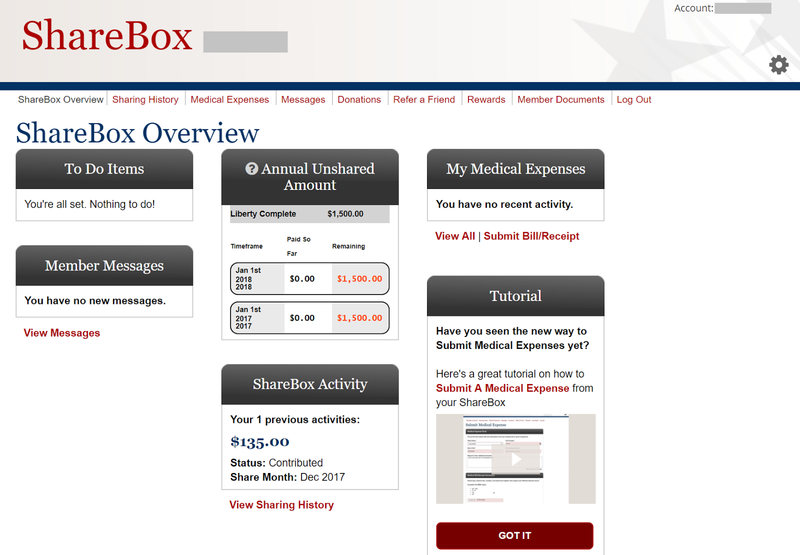 That is an initial preview of the ShareBox from Liberty HealthShare. You can expect to see much more about how this works as we incur expenses and interact with Liberty.